There are few authors who get me as excited about a new release as Moers since his The 13 1/2 Lives of Captain Blue Bear is probably my favorite comic Fantasy of the last decade. A new Walter Moers book means I put aside whatever I am doing and start reading with a profuse amount of breaks for laughter. I'm always amazed by how good the translations by John Brownjohn are for these books as Moers is known for creating words and tweaking many others to his twisted pen. 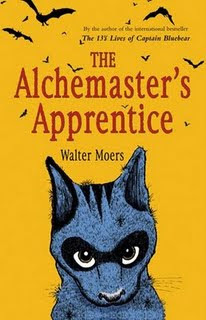 Accompanied by dozens of illustrations by Moers The Alchemaster's Apprentice is the fourth Zamonia novel after The City of Dreaming Books ,which keeps to the same high quality as previous books. The series to this point has been far sweeping stories that explore the lost continent whether it be across the land or under it, however the latest entrant breaks from that mold as it stays in the just one place, which is the unhealthiest city in Zamonia, Malaisea, where the resident Alchemaster Ghoolian reigns over the sickly populace. The Alchemaster's Apprentice is the most intimate and shortest tale to date, but is no less entertaining for its brevity. As with all Moers books it centers on one character's life story, in this case Echo the Crat. A Crat looks like a cat but has the special ability of being able to speak to any creature and retain any knowledge told. We meet Echo as he is starving on the streets of Malaisea since his former owner passed away. Ghoolian comes across the begging Echo and strikes a bargain to feed him for a month with the most sumptuous food from all over Zamonia. At the end of the month the Crat will give up his life in order for his fat to be rendered for the Alchemaster to use in his experiments. At the time it seems like a good bargain for the slowly expiring Crat, but he quickly changes his mind. In one sense The Alchemaster's Apprentice is still a tour Zamonia only it focuses on the culinary and magical sides of the world, which Ghoolian has been amassing for decades in his home. Ghoolian houses Echo in his ancient castle that holds as many wonders as the rest of Zamonia, many of which can no longer be found elsewhere. This is not the bloodiest Zamonia tale, which was Rumo, but it is the most morbid of the lot as Ghoolian likes to perform taxidermy of myriad creatures and he is all about boiling creatures down to balls of fat along with having a deep disdain for most living creatures. Moers plays with the Ghoolian character trying to give him many sides to his dark face to keep Echo guessing what is truly inside him which works fairly well and leads to some good surprises towards the end. Echo explores the castle as well as the town where we get to meet a marvelous yet small supporting cast of odd creatures including a friendly ghost, a lonely toad, and a great Uggly Witch. I don't say Uggly to deride the character's looks, which while atrocious is actually her species name. The Alchemaster's Apprentice is a dark fairy tale for adults that keeps you laughing even through the most gruesome of parts. The ending was a bit expected, but the journey to get there what the fun is all about. I give The Alchemaster's Apprentice 9 out of 10 Hats. I'd recommend reading at least The 13 1/2 Lives of Captain Blue Bear before this one; although all the Zamonia books are written as standalones with no main character reappearing yet having read previous volumes does help with knowing many of the references to different places and species. I'm curious as to whether Overlook will be translating Moers's Hansel & Gretel/Zamonia tale since that is the only book that hasn't had an English release, yet it came prior to The Alchemaster's Apprentice in German. Moers shows that he is in nowhere near running out of stories for Zamonia and nor should he. I for one hope he can turn out as many novels as Pratchett has done with Discworld. Okay, seriously, why is this author not been discovered by yet? Thank you so much for this review. Sadly I doubt I will get these books soon [read that as ever] but I love dark humor and weird fairy tales. I agree wholeheartedly. Everyone should give Moers a chance. At least in the states Blue Bear did really well. 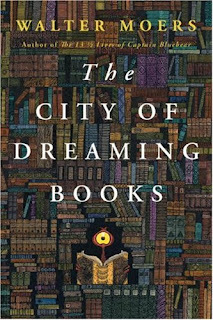 The City of Dreaming Books was amazing. Just when I thought Moers didn't have any place left to explore he surprises you. That's the thing with cooky worlds. As long as the only thing restricting the author is his imagination, then stories can never truly stop from coming. I've been hanging out for the translation of this since I saw a bookstore in Bonn advertising the new Walter Moers in 2007 - far too long, but no less appreciated from the waiting. I just picked up a copy the other day & I haven't been disappointed so far!